Here it comes - pillowcase has been completed! Determination rulzzzz! This is the front bit. This the back of the pillow. I tried out a bit of creative freehand quilting and I'm quite happy about the outcome. Defects look like effects for me - the lilac material really was too thin and soft in comparison with the top sateen. 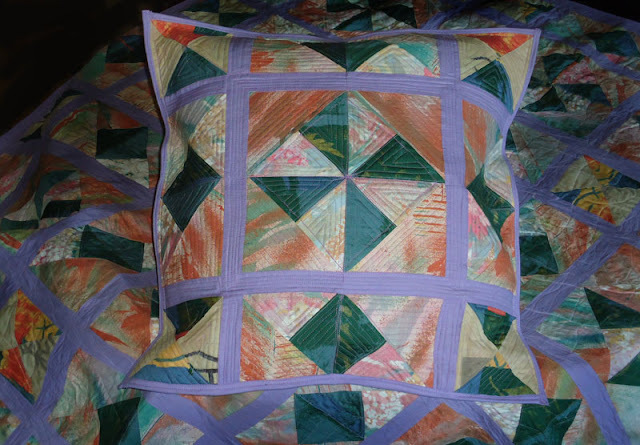 And this - pillowcase inside out on the other side of the quilt. So yes, I can use it as I like for the moment - matching, but completely different feel for the set. 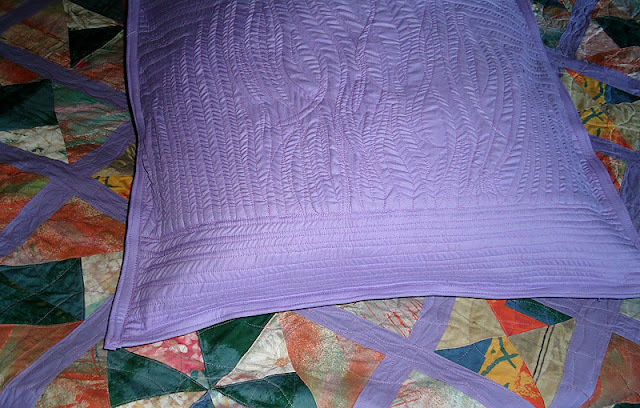 And the best - the inside looks as the top side so one way or another - this will be usable as I wanted it to be. That's about it all today. Tomorrow is for the curtains. It would be nice to post something clever and remarkable but I'm too tired. After I finished with the pillow, I went to Zoo with my youngest and spent 5 hours there. I do not feel very clever after that. It's beautiful night outside, windows wide open, and upstairs neighbour playing guitar on the balcony. Life can be good, isn't it?